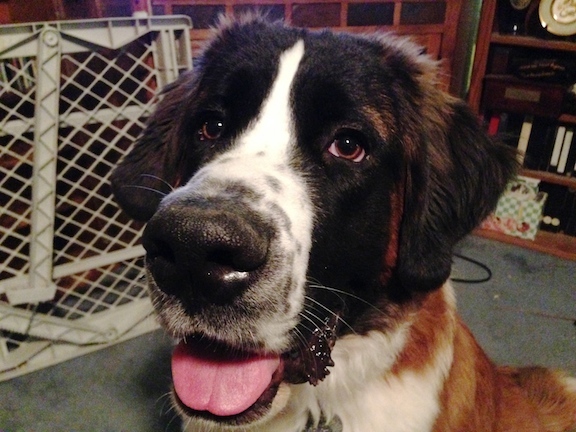 Raven is a six-month-old St Bernard puppy. Her owner called me for help with a few new habits she had developed; counter surfing, constantly leaning on her and chewing inappropriate things. When I arrived for the session I could tell that Raven had a nice medium energy and a good confidence level. She was curious, but not overly excited or anxious as most of my client’s dogs are. While these are very basic rules, the fact that they will be utilized several times daily can have a cumulative effect on a dog’s behavior. I always want my client’s dogs to follow their owner’s commands and lead because the dog respects their authority. Asking a dog to do something before it gets what it wants is a great way to develop the leader follower dynamic. Because of her short attention span, I demonstrated a leadership exercise to help Raven learn to focus as well as self restrain and look to her human as her pack leader. It took quite a while before Raven got what I was asking from her, but once I did, she responded faster and faster. Once I knew she had it, I coached her owner through the exercise until she was getting the same results. I suggested that her owner repeat this exercise a few times a day to help Raven develop those behavioral skills. Next we discussed how to disagree with unwanted behaviors as well as helping Raven respect people’s personal space. As many dogs do, Raven was constantly leaning on or against her owner. By disagreeing with the behavior using my set of escalating consequences, it only took a few corrections before Raven was giving her owner a foot or two of personal space. By the end of the session Raven was following her owner’s lead as if she had been doing it all her life. With a week or two of strict adherence to the new rules and boundaries we went over in the session, these new behaviors will become the new “normal” for Raven.